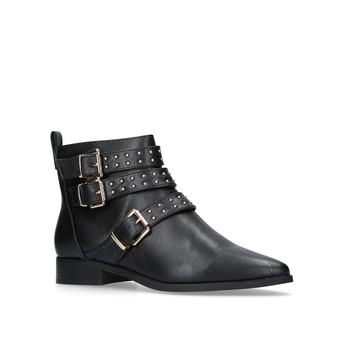 Adorned with gold or silver buckles, multi-strapped and buckled flat boots will define your off-duty wardrobe for the next six months and look best paired with black skinny jeans and an oversized shearling jacket. 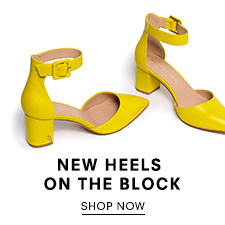 The buckles add a tougher, rock 'n' roll inspired touch that immediately accessorises your look without you having to do, or buy, anything more. 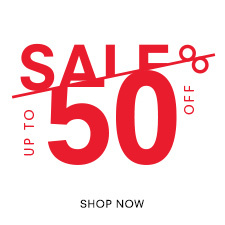 If you gravitate towards pieces decorated with heaps of gold hardware, opt for either Carvela Kurt Geiger Swish or Miss KG’s Jules boots. The former – covered in studs and on-point pearls - is ideal if you like a slightly higher cut with a slim fit ankle, whilst the latter is a little more bohemian in design – looser at the ankle and great with printed minis and tights. For silver fans, Carvela Kurt Geiger’s Scant boot is a sleek offering that will toughen up dresses and cosy knits alike. A serious contender for ‘biker of the season’. 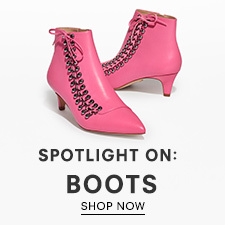 Buckles can still have an impact even if they aren’t the focal point of your shoe. In fact, when it comes to a heeled ankle boot, a minimal luxe buckle can be just the elegant finish needed to complete your look. Take Miss KG’s Spring boots; adorned with a gold studded strap and one simple buckle, they can be worn with a whole host of on-trend looks. Try a pleated midi skirt, fitted knit and leather jacket for a smart day to night combo. Another pair of subtly buckled beauties we can’t get enough of is Carvela Kurt Geiger’s Lucifer monk strap flats. An excellent office option with crisp shirting and tailored trousers, the wine hue ticks off another huge AW17 trend. 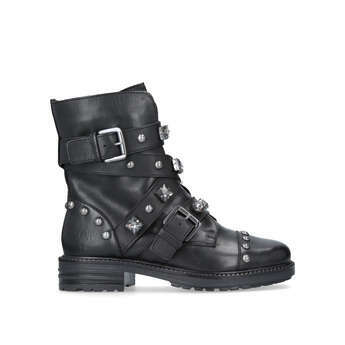 For a boot buy that straddles the smart/casual spectrum, look no further than Carvela Kurt Geiger’s Soldier. Bold without being OTT, military-inspired gold buttons update this super-wearable ankle boot shape. Show them off with cropped culottes and midi hemlines. Then, there are the details that quite literally define the shoe they are attached to. First up, the statement slide, which won’t be going anywhere for winter thanks to Mulberry proving that, when paired with a thick sock, it is absolutely A-OK to wear sandals past summer. 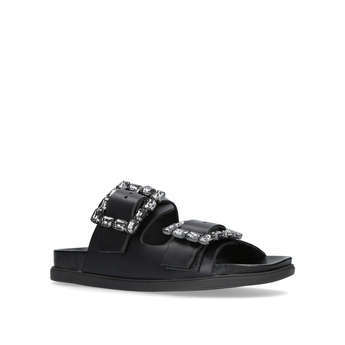 Carvela Kurt Geiger’s Candy and Kash slides in black are where it’s at on the winter sandal front. Candy boasts two major pearl-embellished buckles while Kash comes complete with jewelled versions. 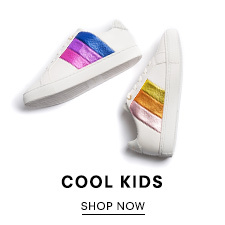 We’ll be wearing both with wide leg trousers and smart outerwear. 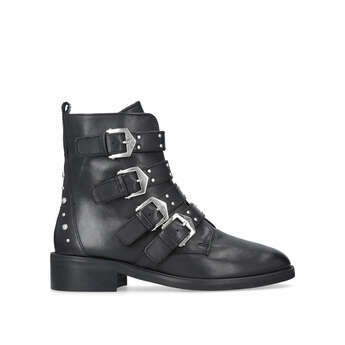 For something with a little more coverage, invest in KG Kurt Geiger’s Raven boot. In classic black or on-trend white, Raven’s multi-tone cigarette heel is guaranteed to have everyone asking ‘where did you get them?’ Wear with a red dress for maximum impact. 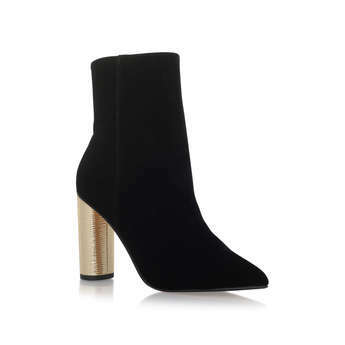 With their velvet finish and gilded cylindrical heel, boots don’t get any more luxe than KG Kurt Geiger’s Reign. 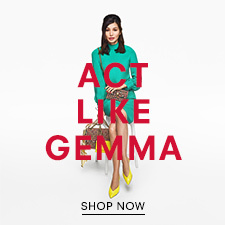 On or off-duty, Kurt Geiger London’s Stoop, a jewelled and buckled biker, is the perfect juxtaposition of feminine and edgy and will work with floaty dresses and relaxed denim alike. Beautifully decorated bags are big news at Kurt Geiger this season too. Perfect for the upcoming party season (it’ll be here before you know it) but, thanks to the street style set, embellished bags are no longer strictly for evening. 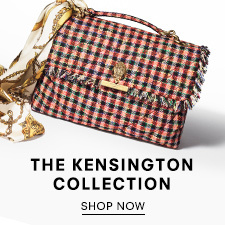 The iconic Kensington bag has been re-worked in tweed, faux fur, brocade and velvet, with Kurt Geiger’s signature eagle clasp providing the decorative cherry on top. The Plum cross body is another great day-to-night option, choose from a floral "Love" slogan, faux fur and jewelled pineapples or a chic tweed number embroidered with beaded swallows. For a fashion pack-approved look, wear statement shoes and bags together. Go on, we dare you.